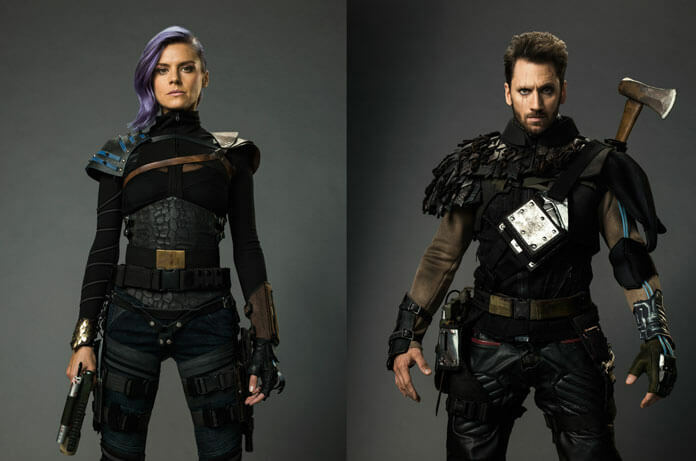 Eliza Coupe (Happy Endings) and Derek Wilson play Tiger and Wolf in Hulu’s new sci-fi comedy series, Future Man. Their characters are from the distant future, 2162, and they’ve lived their whole lives in constant battle. Needing a change, they go back in time to find the person they believe will be their savior. “We come from a place that’s very violent. We live in a sewer,” explained Wilson, attempting to avoid any spoilers. The Future Man stars revealed their characters eat rats and garbage to survive, painting a bleak picture of this fictional future. Teamed up for interviews at the 2017 San Diego Comic Con, Eliza Coupe and Derek Wilson described the series, its tone, and getting prepared for a show about time travel. Future Man is set to premiere on November 14, 2017. What are the people wearing in the future? Are there deeper meanings behind the names Tiger and Wolf? Is there some characteristic about your character that fits with that name? Have you always wanted to play badass warriors? Did you have to do any tactical training? What happens when your characters find out the person you thought was going to be the savior isn’t what you expected? What surprises your characters about 2017 when you arrive? So, you’re playing it serious because the stakes are life and death? Of the different time periods you visited, which one did you like the best? The ‘80s weren’t that great. How much green screens and how much is real sets?